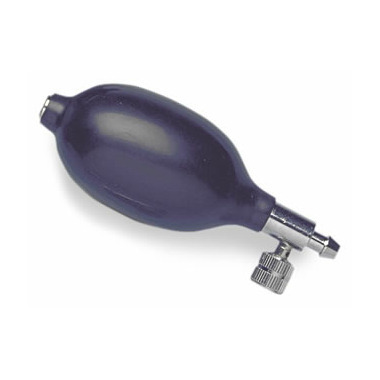 Standard Air Release Valve with Inflation Bulb complete, for blood pressure monitors. I ordered this as a replacement for a sunbeam blood pressure meter. It did not work. I contacted Well.ca who referred me to the manufacturer who immediately tested and sent me a replacement. A sign of good organization is that any problems are addressed promptly. I often measure blood pressure and needed to replace the rubber bulb in the unit. All I found on the Internet was very expensive. The attractive price and the low postage expenses were only in Well.ca When I replaced the rubber bulb in the instrument it should be noted very good quality of this product. Thanks very much to Well.ca! Item Abordable, trÃ¨s bonne qualitÃ©, livraison rapide, client trÃ¨s satisfait ! Low price, very good quality, fast delivery, very satisfied customer ! I was trying to find a replacement bulb for my blood pressure monitor, without success, until I happened onto Well .ca. The price was low, delivery was fast, and once received the bulb was of good quality, well built, and functions very well. I was most impressed with how well informed I was kept with regards to progress of my order. Decent quality product at a reasonable price! I have used this cream for many years - it really works well overnight to keep eyes from drying out.